True leaders, who are sincerely committed to the people and honestly care for the environment are extremely rare and precious these days. On Monday, August 22, 2011, Canada and the world have just lost one of these compassionate, talented, visionary leaders, Jack Layton, leader of the New Democratic Party. He passed away from cancer this day. His awareness, diplomacy, compassion and leadership skills transcend political parties. He left with his family a letter to share with Canadians upon his passing which you can read in this huffpost article. At the end of the letter he states “My friends, love is better than anger. Hope is better than fear. Optimism is better than despair. So let us be loving, hopeful and optimistic. And we’ll change the world”. What more stunningly appropriate words could Jack Layton, a true statesmen and leader share with Canadians upon passing. He is truly a kindred spirit. 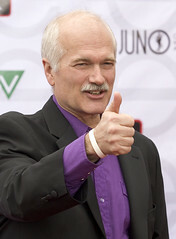 May all readers of this blog create a moment of silence in honor of Jack Layton, a leader that is sorely missed. May his life stimulate other leaders to emulate his beliefs and carry on his magnanimous efforts and help them manifest into a new reality for this world. Our thoughts and prayers are with him and his family.